Investors are faced with many options when they want to invest responsibly. To ensure they get the results they’re after, investors must first sort through the principles that support each option, starting with what ‘responsibly’ means. In the following paragraphs, I will outline two very different understandings – first as practiced by investment analysts and second according to investor values or behavior – and then show where these two theoretical poles are beginning to merge. Investment firms which manage portfolios on behalf of another party (including mutual funds and exchange traded funds [ETFs]) are amongst the largest investors and many are signatories to the United Nations backed Principles for Responsible Investment (PRI), based in London, England. The PRI defines ‘responsible investment’ as the integration of environmental, social and governance (ESG) factors into the analysis and selection of investments, and into ownership activities such as engagement with management and the voting of proxies at shareholder meetings. Consistent with Modern Portfolio Theory (MPT), which among other things guides investors to broadly diversified portfolios, ESG integration does not limit the types of investments considered. Rather, it mandates consideration of the impact that material ESG issues might have on the risk and return profile of each investment – over and above what may be available from standard financial statements. Determining which ESG issues are material to a company and how to measure those issues is an emerging area of interest that has recently received a lot of high-profile support, including from Mark Carney (Governor, Bank of England, and formerly Bank of Canada) and Michael Bloomberg (former mayor of New York). The benefit to analysts of integrating ESG factors is the potential discovery of hidden risks that are not apparent on regular financial statements and a better chance at outperformance. The benefit to society (i.e. the reason this is considered ‘responsible’) comes from public companies paying attention to the ESG issues that are important to financial analysts, disclosing and reporting on those issues publicly, and in many cases, changing their corporate behaviour. Measurement and transparency lead to better ESG outcomes. ESG integration also requires consideration of material ESG factors on the ownership side of investing. By voting on shareholder proposals that seek better ESG outcomes, investors can further improve the ESG practices of public corporations. Large investors may even have a chance to engage directly with a company’s management on environmental, social or governance issues – a ‘behind the scenes’ opportunity which can advance corporate ESG practices considerably. Active ownership leads to better ESG outcomes. This is only one side of the conversation. Notably, PRI’s definition of ‘responsible investment’ does not involve personal values or the screening of investments for particular trending attributes such as high carbon oil (out); low carbon wind or solar power (in); tobacco (out) and strong diversity policies (in). In contrast, many investors have strong personal views about these and other issues, and want their investment portfolios to reflect their individual values. Fortunately for these investors, there are many mutual funds and ETFs willing to accommodate their principles. Screening of portfolios for particular attributes has a long history, rooted many decades ago in the exclusion of select stocks by certain religious organizations that were seen as anathema to their values. Eventually, the practice evolved into what is often called ‘socially responsible investing’ (SRI), ‘ethical investing’ or when tilted towards environmental issues, ‘green investing.’ It is based upon personal values and may be different for each investor. Screening may lead to a portfolio that is less diversified than MPT prescribes, but in practice, modest amounts of screening may have little impact, especially over the long term, and could have offsetting or larger benefits. Behavioral finance theory shows that control over one’s choices instills greater confidence in the outcomes, which may result in a higher likelihood of staying invested during volatile markets. As well, investing according to commonly held values, such as concern about global warming, can send an important social signal. People often chat at social gatherings about their investments, sharing their personal perspective and affirming mutually held values. As our societal values evolve, so do the regulatory and legal frameworks that mandate (hopefully) better ESG practices. Corporations pay attention to their social licence and to the values of their consumers, and tailor their ESG practices accordingly. Notice that the processes for the analysis-based ESG integration and the behavior-based portfolio screening are quite different. Just as neoclassical finance and behavioral finance co-exist and explain different aspects of the stock market, so to do they explain different aspects of ‘responsible investment.’ With the two different investment approaches outlined, we can now explore where they are starting to overlap in practice. Some studies show that companies which performed well or showed improving ESG metrics often outperformed or had lower risk than their peers. While past results are not necessarily indicative of future performance, the studies do encourage further consideration and research. For example, another group of researchers is using this type of data to propose inclusion of ESG as a systemic factor within MPT – showing a robust theoretical model that ESG factors are generally underpriced in the market and that they offer higher returns and/or lower risk. Many mutual funds and ETFs offer broad screens of ESG factors which align with commonly held values – a happy convergence of behaviour and emerging financial theory – and they may use active ESG integration as well. While this article has focused on investment vehicles such as mutual funds and ETFs, many investors also hold stocks and bonds directly. Investors should discuss with their advisor how to best meet their responsible investment goals. Do they want to invest according to their values or follow MPT and rely on ESG integration, or use a blend of both? If values are part of the mix, it is important to ask if the investment performance of the screen is supported by research or if some diversification being sacrificed? Is there capacity to integrate ESG considerations into the analysis of stocks and voting of proxies, or should they rely on the expertise of a mutual fund or ETF? Responsible investing is an evolving field, both in practice and in the research that supports those practices. It has a critical part to play in improving corporate transparency and environmental, social and governance (ESG) outcomes, and investors have an important role in ensuring their money contributes to these responsible results. The information contained herein is for general information purposes only and is not intended to provide financial, legal, accounting or tax advice to be relied on without an individual first consulting with their financial advisor to ensure the information is appropriate for their individual circumstances. In 2016 Inspirit Foundation – a public foundation working to promote inclusion and pluralism through media and arts, support for young change leaders and impact investing – committed to a 100% impact portfolio to leverage our full asset base for financial returns and positive social and environmental impact. When we committed to a 100% impact portfolio, most of Inspirit’s portfolio was in the public market being managed by three investment managers with balanced mandates who were tasked with investing across the asset classes of fixed income, Canadian equities, and global equities. In order to analyze the performance of our investments, we conducted an audit of our portfolio based on our updated IPS. Then, we enlisted the support of our investment consultant, Proteus, to assess financial performance using four main indicators: net returns vs. benchmark, information ratio, up-market capture ratio, and down-market capture ratio. We also subscribed to research offered by MSCI to understand the carbon and impact performance of our portfolio. This research allows us to measure our portfolio’s exposure to carbon emissions. Our portfolio’s positive impact is assessed through Environment/Social/Governance (ESG) scores and revenue from products and services that contribute to the United Nation’s Sustainable Development Goals (SDGs). Next, we benchmarked the financial, carbon, and impact performance of our portfolio against a traditional benchmark, which primarily consisted of the FTSE TMX Universe Bond, S&P/TSX Composite, and MSCI ACWI (CAD). For aspirational purposes, we also benchmarked our portfolio’s performance against the MSCI Sustainable Impact Index, a benchmark with strong financial results, a low carbon footprint, holdings that are top performers along ESG metrics, and a selection methodology that identifies holdings deriving 50%+ of their revenues from products and services contributing to the SDGs. The analysis indicated our portfolio had room for improvement on financial, carbon, and impact performance. In order to improve portfolio performance, we committed to transitioning from a balanced portfolio approach to a specialized asset class style. Data demonstrated to us clearly that it is rare for investment managers to consistently sustain outperformance across multiple asset classes. We determined we needed to transition Inspirit’s portfolio management from three investment managers with balanced mandates investing across asset classes to investment managers each with specialized mandates to invest in specific asset classes. After reviewing and scoring all the submissions, we conducted two rounds of interviews before coming to a final decision. In the end, we were pleased to select Addenda Capital as our new manager and allocate our entire public fixed income portion of our portfolio to their Impact Fixed Income Fund. With our investment in Addenda’s Impact Fixed Income Fund, we now have over 85% of our portfolio invested in impact investments. These investments are top performers along environmental, social, and governance metrics and ideally also earn at least 50% of their revenue by contributing to the United Nations Sustainable Development Goals. We plan to continue to transition our portfolio from one with traditional investments to one entirely composed of impact investments, and also one with a balanced investment approach to one with a specialized asset class investment expertise. The next step is a Request for Statement of Interest and Qualifications for a global equities manager, followed by a search for a Canadian equities manager that can satisfy the financial, carbon, and impact goals outlined in our IPS. We expect to fully transition to a 100% impact portfolio in 2020. Please follow our progress here. As many other foundations do, the J.W. McConnell Family Foundation acts as prudent steward of its endowment to ensure that we can meet our granting priorities. Established in 1937, our mission is to support Canadians in building a more inclusive, innovative, sustainable and resilient society. We use the lens of systems transformation — changing policies and institutional culture in order to address the root causes of societal challenges – to guide our strategy and investments. The Foundation has an endowment of $650M managed in perpetuity with current yearly charitable disbursements of about 4%. In 2007, we also recognized that if we are to contribute meaningfully to pervasive social and environmental challenges, we will need to harness the full range of our unique assets, capabilities, and positioning, and we need to work collaboratively within and across sectors. We began our exploration of impact investing, which was an opportunity to attract private capital to scale impact, and complement our philanthropic objectives in the community sector. At the Board of Trustee’s directive, we started with an allocation of 5% to impact investing which subsequently became 10%. 3. Stimulate the development of a social finance marketplace through co-investments in new financial models and with like-minded investors. Examples of the above include Renewal Funds which invests early stage in social impact companies, Community Forward Fund which provides lending capital to small and medium size Canadian charities and non-profits, and CoPower which enables green bond access for individuals, using the proceeds to invest in clean energy and energy efficiency projects. As we grew our impact investing portfolio, we realized that the opportunity to harness the power of capital to advance social change was broader than we initially envisioned. A first expansion of our boundaries took place when we invested in NEI, which gave us a flavour of how you can be intentionally impactful when investing in public equity strategies. Later, we were involved through granting and investing in an Indigenous on-reserve housing project which in its pathway to scale anticipates greater involvement of the “mainstream” capital market actors, and not just foundations and governments. This and other examples led to the redefinition of our internal practice as Solutions Finance – which we define as an integrated approach to deploying financial capital and adapting financial models to catalyze, sustain and scale systems transformation. This reframing recognizes our role as an asset owner with a diversified portfolio that can be aligned with our impact objectives, our role as a convener to encourage multi-sector collaborations, and our role as a grantmaker to support systems innovation. A subsequent phase of our work began with a commitment to have 100% of our assets managed responsibly over the coming years. As the Canadian market evolves, with more capital being intentionally directed in this way from institutional and retail investors, and greater availability of products, we are optimistic about the opportunities to engage in this area. As we reflect on our journey, we would like to highlight four lessons from our experience that may be relevant to asset owners that already have, or aspire to, align and deploy their assets for impact. An important realization for any asset owner is that all investments in your portfolio can be steered to have social and environmental impact. Although we do not yet have the required suite of tools to fully account for this, including impact measurement standards, acknowledging this reality has changed the way we view our goals and opportunities to transform systems with finance and investments. It encouraged us to use the full range of assets that we bring to the problems we seek to solve, which was important since many of the ‘wicked problems’ that exist require a range of solutions and various forms of capital along the way. 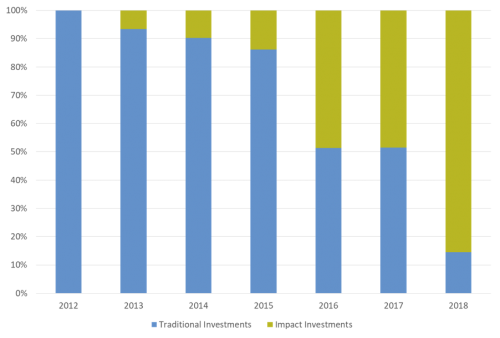 Impact investments hold “intentionality” at the core of their strategy. They are meant to direct capital to solve targeted social and environmental challenges. However, it should be obvious that not every investment can lend itself to this approach. That said, we can insist on parameters that ensure all our investments meet a minimum standard of reducing negative impacts while also progressively increasing good environmental, social, governance, corporate and general sustainability practices. For example, we can actively participate in shareholder activism with specific companies that are influential in the sectors in which we have granting programs, or in a less engaged manner require specific disclosures or increased transparency from our managers. In this way, our responsible and sustainable investment practices also contribute to improving broader social and environmental outcomes in complementary ways. We deploy a range of complementary approaches across our portfolio, For example, we direct certain impact investment allocations for credit enhancement or risk mitigation for nonprofits and charities, while we direct other parts of the portfolio to scale organizations that have proven approaches and evidence in a specific area. As a foundation, we are unique in our ability to take risk through blended structures that optimize for both impact returns and financial returns; however, as we seek to maximize our impact, we will not sacrifice financial returns where it is not a fit. Evidence from us and others is that trade-off between financial and impact returns is not inherent to every impact investment; it all depends on your goals, preferences, and flexibility. Many private and community foundations, as well as institutional and private investors, are also committing significant dollars and time to uncovering and supporting community-based initiatives that can harness these types of capital to deliver positive impact. Our experience has shown that these collaborations are necessary to support product issuers and community initiatives to deliver on their objectives – whether it is sharing information, tools, training, networks or bringing to bear other institutional assets. 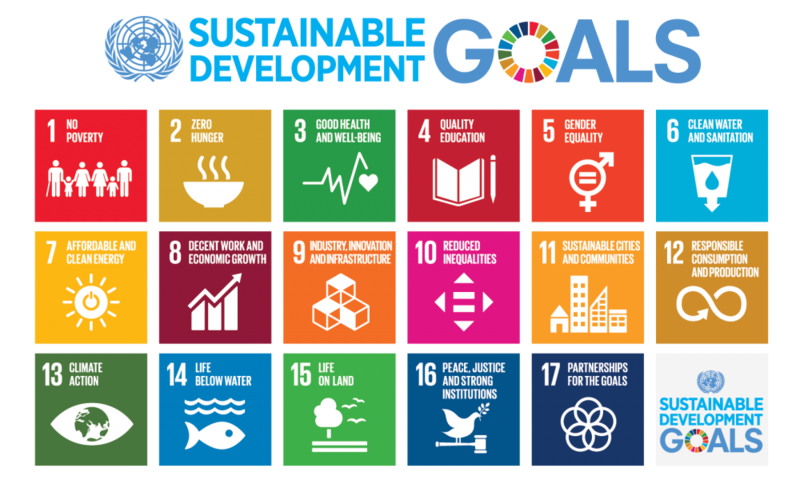 Collaboration is also important as we think about designing and resourcing interventions at scale if we are to achieve the Sustainable Development Goals (SDGs). We will continue to advance in this way, and hope that many other investors will join as we work collectively towards the wellbeing of our societies and our planet. There is growing recognition within the investment community that climate change poses material risks to investments. Investors are eager to understand and address material carbon risks in their portfolios not only to achieve better performance of their investments, but also to take advantage of opportunities arising from the shift to a low-carbon economy. In addition, the Task Force on Climate-related Financial Disclosures (TCFD) and other regulatory bodies have emphasized to investors the importance of disclosing climate-related risk in portfolios and called for a focused approach to manage these risks. Understanding climate risk in portfolios starts with investors asking two important questions. What climate risks is the portfolio exposed to? And what is the degree to which the companies in the portfolio are exposed to these risks? Applying a materiality lens to take a closer look at investee companies reveals two types climate risks – transition risks (or carbon risks) and physical climate risks. Depending on the industry and geography, both risks could have a significant impact on a company’s business and therefore, increase portfolio risk or decrease portfolio performance. The need to reduce man-made greenhouse gas emissions and the shift to a low-carbon economy has the potential to disrupt many established practices, processes, operations and products of companies. These risks, commonly referred to as transition risks, are spurred by regulation, customer preferences and low-carbon technology alternatives. Physical climate risk such as threats to businesses due to heat stress, extreme rainfall, drought, storms, sea-level rise and wildfires and second-order effects such as ecosystem collapse, hunger, disease and mass migration would have serious impacts on companies depending on the degree to which they are exposed to these risks. One could conclude that physical climate risk would continue to increase if sweeping measures to reduce atmospheric greenhouse gases are not adopted. Drastic greenhouse gas reduction measures would invariably increase the transition risks on companies as they would have to adopt and survive under these constraints. The degree to which investee companies are impacted by transition risk requires an understanding of how these companies are exposed to these risks and how they are managing them. Assessing a company’s exposure to transition risks leads to the conclusion that different industries are exposed to transition risks differently. In addition, within an industry, companies have varying degrees of exposure to transition risk. For example, an oil and gas exploration company has significantly higher transition risk than a healthcare service provider. This has significant implications on how investment portfolios are constructed. A sectoral view of a portfolio reveals a higher portfolio weight in high transition risk industries would inherently make the portfolio risky. This also has implications on portfolio types. An energy sector portfolio will inherently have significantly higher carbon risks than a healthcare sector portfolio. Interestingly, a well-diversified portfolio with exposure to all the sectors would have lower carbon risk as low risk sectors such as healthcare and information technology (IT) would balance out higher carbon risks from energy and utilities sectors. Another notable point would be the impact of portfolio styles, such as value or growth, on carbon risk. Typically, value portfolios tend to invest in energy and utility sectors which have high carbon risk, while growth portfolios tend to have high exposure to low carbon risk sectors such as IT. In conclusion, both physical climate risks and transition risks will impact portfolio returns through their holdings and a careful and deliberate analysis is needed. Interestingly, these two risks have somewhat of an inverse relationship – an increase in transition risk would result in lower physical climate risk. Understanding the degree to which sectors and companies are exposed to these risks is paramount for addressing climate risks in portfolios. This would determine not only the type of holdings within a portfolio, but also portfolio type and style. Better understanding of RI and its benefits starts by changing how we talk about it. It’s tempting to look at the rapid uptake in Responsible Investing (RI) solutions and conclude we’re doing everything right. RI assets in Canada are growing – now over $2T, up 42% the past two years. RI-focused mutual fund assets are up 34% and have grown to over $11B. And RI now represents just over half of the Canadian investment industry – up from 38% two years ago. This is just some of the exceptionally good news you can find in the latest RI Trends Report. If we, as RI practitioners, all sat back and did nothing, it seems the RI wave would continue to grow. But sitting passively by is not in our nature or interest. And it’s a good thing, too. Because for all the success we’ve witnessed around the adoption of RI, the persistent challenges to more widespread adoption – the perception of underperformance, for example – remain squarely in our path. Until we find a way to resolve those challenges we will not reach RI’s true potential. So how do take RI to the next level? Let’s start by looking at the difference between institutional and retail channels in the adoption of RI. In the institutional space, which typical leads the retail trend, RI is humming along nicely. Institutional investors appear unmoved by the RI performance myth. In fact, the RI Trends Report survey found that the managers of pensions and institutional money favour RI for its risk benefits, return potential and overall fiduciary duty. In the retail space, the growth trend has also been strong, albeit from a lower base. What’s concerning here though is the apparent disconnect between retail investors (who have made it clear they not only support companies that consider ESG factors in their operations, but also fully expect their advisors to incorporate ESG considerations into their investment portfolios), and their advisors. According Allianz Global Investors, only 14% of advisors proactively introduce RI into their client conversations. When asked about the reluctance to incorporate RI into their practices, advisors trot out the usual suspects: performance concerns, lack of solution breadth and the assumption that since their clients aren’t asking for RI specifically, there must be a lack of interest. We know all this to be patently untrue. And though we’ve banged our heads against the wall for years trying to overturn these perceptions with clear, seemingly irrefutable evidence, it doesn’t seem to matter. There may, however, be another reason for the reticence, one we hear with increasing frequency. Despite the obvious potential for business growth many advisors tell us they don’t introduce RI because they simply don’t know how to talk about it. And why is that? It might be because we, the providers and promoters of RI solutions, aren’t helping them. It all comes down to how we talk about it. Typically, we position RI one of two ways: we either lead with our values and present RI as the “right thing to do”. Or we lead with facts and argue that RI is a better way to invest. Both approaches have the potential to inhibit rather than enhance adoption. When we lead with values, we’re asking an advisor or investor to believe in the same things we do. What are the odds of that? Like people everywhere, advisors and investors come to the table with deeply ingrained beliefs. And if those beliefs are not aligned with the values of RI, there is little chance of changing them – at least in the short term. When we lead with the facts of RI, we run the potential for even greater disassociation. RI performance data may resonate in the institutional world, but if many retail advisors truly believe RI underperforms, hitting them over the head with our facts is unlikely to change their minds. Advisors who have invested successfully for their clients (and after the bull run we’ve had that’s probably everyone) are unlikely to respond well to the message that they’re doing it all wrong. The solution to this dilemma lies in how we frame the RI conversation. Instead of talking about what RI is, or how it works, wouldn’t it better to open the conversation with a discussion of what RI can actually do for investors? Talking about RI this way addresses what matters most – meeting investor needs. A needs-based conversation puts advisors on much more solid ground when discussing RI as well. What advisor hasn’t, for example, talked to investors about the need to manage risk? Or uncover new opportunities for growth? These are universal needs that can be met in very distinct ways through RI solutions. There are also burgeoning investor needs such as the desire to make a positive impact beyond investment returns that only RI solutions can meet. Framing the conversation in a manner that puts the client’s needs first also sets the advisor up to demonstrate real value, a critical consideration in a post-CRM2 world. Ultimately, the key to making that big RI breakthrough we all want is about making the right connection with our audience. We’ve achieved a significant degree of success talking about RI the way we always have. Is that enough to keep RI growing? Or could changing the conversation lead to greater adoption? By reframing our discussions around the spectrum of needs that RI solutions are uniquely structured to meet, we’ll make it easier for advisors to talk about RI and stand a much better chance of having both advisors and investors overcome the perceptions that currently prevent more widespread adoption. The views expressed are those of the author and not necessarily those of NEI Investments. With steadily growing demand for responsible investments, the mutual fund industry has answered with a wide array of options. Here are some features to consider when evaluating RI funds. Is there a majority of independent directors? Does the company have a code of conduct and business ethics? Do the company’s main products or services contribute to, or detract from, quality of life? Is the company developing products that advance or detract from sustainability? Does the company have a history of good or poor employee relations? Does the company contribute to employee health and retirement plans? Does the company have a commitment to increasing gender and ethnic diversity? How diverse are the board and senior management? Are employees compensated for volunteer work? Has the company been involved in disputes with the community? Does the board have a human rights policy? Does the company monitor working conditions at supplier facilities? How does the company’s environmental performance compare to competitors? Does the company provide regular information on environmental performance? Different investment funds will hold companies to different standards when it comes to ESG performance. The stricter the standard, the more responsible the fund. A positive screen goes one step further by seeking out companies that actively pursue an ESG agenda, such as clean energy development. A company with a clean bill of ESG health may make it into an RI fund, but what happens if, over time, it fails to maintain high ESG standards? This is where shareholder engagement can play a role. This involves using the fund’s leverage and influence as shareholder to call company boards and management to account. To increase its effectiveness, shareholder engagement is often undertaken by a group of likeminded shareholders. Portfolio managers can urge banks and other financial institutions to conduct thorough ESG risk evaluations prior to financing projects with potential adverse environmental or social impacts. With the growing popularity of RI, the market is now flooded with potential options – but that doesn’t mean they all meet high ESG standards. If you’re concerned that some funds may only be paying lip service to RI, there is a simple way to root out the pretenders: check the prospectus for an unambiguous statement that identifies RI as a core investment objective. If no such statement is present, the portfolio manager may not have a very strong commitment to RI. IA Clarington Inhance SRI Funds, managed by sub-advisor Vancity Investment Management Ltd., are an example of a responsible investment option that incorporates all of these features. The Inhance SRI Funds use an active, integrated approach that combines strict ESG criteria with rigorous fundamental financial analysis. Global Sustainable Investment Alliance, 2016 Global Sustainable Investment Review. The information provided herein does not constitute financial, tax or legal advice. Always consult with a qualified advisor prior to making any investment decision. Statements by Vancity Investment Management Ltd. represent their professional opinion, do not necessarily reflect the views of iA Clarington, and should not be relied upon for any other purpose. Information presented should not be considered a recommendation to buy or sell a particular security. Unless otherwise stated, the source for information provided is the portfolio manager. Statements that pertain to the future represent the portfolio manager’s current view regarding future events. Actual future events may differ. iA Clarington does not undertake any obligation to update the information provided herein. The information presented herein may not encompass all risks associated with mutual funds. Please read the prospectus for a more detailed discussion on specific risks of investing in mutual funds. Commissions, trailing commissions, management fees and expenses all may be associated with mutual fund investments. Please read the prospectus before investing. Mutual funds are not guaranteed, their values change frequently and past performance may not be repeated. Yahoo!, Equifax and Sony have all been affected by an increasingly common event: large data breaches that harmed their reputation and caused them to lose the trust of their customers. As external attacks like these happen more frequently, investors need to understand the data security practices of the companies they invest in. They need to be confident that companies are mitigating related risks and are prepared to respond to a breach quickly and effectively. The Sustainability Accounting Standards Board (SASB) defines “data security” as “technologies, processes, and practices that companies employ to protect networks, computers, programs, digital products, and data from external attacks, damage, or unauthorized access.” Thus, “data security” and “cyber security” can be used interchangeably in this context. According to the 2017 PwC US Protect.me survey, 92% of consumers agree that companies must be proactive about data protection and 60% say the responsibility of protecting data rests with companies — not governments. Furthermore, they expect companies to go beyond legal requirements. In light of these concerns, PwC suggests companies put cyber security and privacy at the forefront of their business strategy to retain customers’ trust. A Ponemon Institute and IBM Security study of 419 companies in 13 countries found that data breaches are mainly caused by malicious or criminal attacks (47%), a human error (28%), or a system glitch (25%). Astoundingly, they found that the total cost of a data breach averages $3.62 million. Effectiveness of internal control over financial reporting. Investors looking to assess if a company is protected against data breaches would typically look to company disclosure regarding cyber risks, potential impacts, as well as governance and risk mitigation. However, companies do not disclose this information consistently and completely. In the same review, the CSA found that only 61% of the companies addressed cyber security issues in some capacity in their disclosure of risk factors. These findings can be extrapolated to companies outside of Canada. The PRI recently published a report which summarized a review of 100 companies’ public disclosure on cyber governance and risk management. The research sample included companies in a variety of sectors from Europe, the US, Australia and Asia. The report states that “While companies generally perceived cyber security as a key organizational risk, very few communicated that they have policies, governance structures and processes that were effective at tackling cyber threats.” The report is an excellent tool for investors looking to engage with companies regarding cyber risk. For each key question the research covered, investor relevance is explained and good practices for companies are outlined. Cyber security incidents have the potential to materially impact a company. Investors need to engage with companies to request more comprehensive disclosure regarding cyber risk governance and risk management practices. Hopefully in the future companies will improve corporate disclosure regarding data security. In the meantime, investors can use the PRI report as a guide in their stewardship efforts. The Sustainability Accounting Standards Board. “The State of Disclosure 2017” (2017). PwC. “Consumer Intelligence Series: Protect.me” (2017). IBM Security and Ponemon Institute. “2017 Cost of Data Breach Study” (2017). Canadian Securities Administrators. “CSA Multilateral Staff Notice 51-347 Disclosure of cyber security risks and incidents” (2017). Principles for Responsible Investing. “Stepping Up Governance on Cyber Security: What is Corporate Disclosure Telling Investors?” (2018). 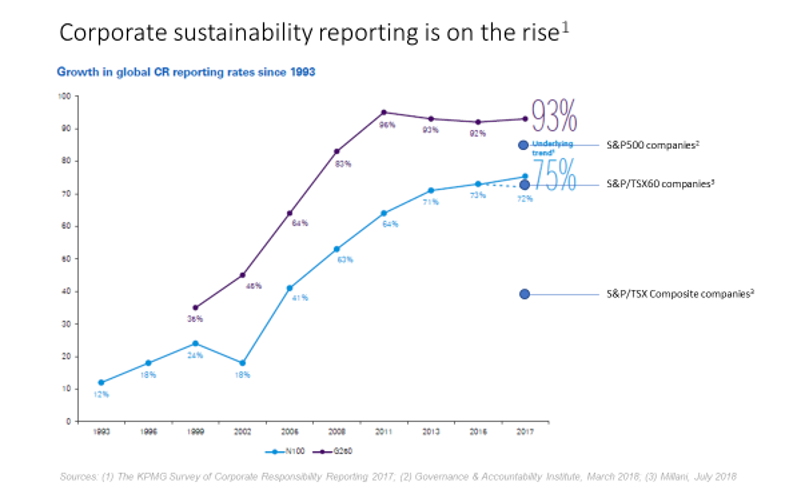 Statistics show that still too few companies report on their sustainability practices, and those that do are still not meeting the information needs of investors. At the same time, as investors mature in their ESG integration practices, they increasingly want issue-specific information and quantitative performance metrics and targets, which only companies can provide. In the end, investors may hold the key to resolving this challenge, through continued engagement with reporting issuers on ESG disclosures. 2018 may very well turn out to be the year that ESG integration goes mainstream in capital markets. So much is happening all at once: increased focus on climate change and the recommendations of the Task Force on Climate-related Financial Disclosures (TCFD); release of the Canadian Securities Administrators’ long-awaited Report on Climate change-related Disclosure Project (which, in our view, opens the door to better disclosure on material ESG issues in general); early signs of evolution towards impact measurement through the implementation of the UN Sustainable Development Goals (SDGs); growing competitiveness of ESG integration among asset managers in the wake of the exponential increase in UN PRI signatories; and more recently, the launch of the Canadian Expert Panel on Sustainable Finance. These initiatives and market forces are pushing the envelope, no doubt, but we should not lose sight of – what is in our view – a key principle of responsible investment, which is to “seek appropriate disclosure on ESG issues by the entities in which we invest” (UN PRI Principle 3), and without which many of these initiatives will not succeed. Working at the intersection of investors and public companies, we regularly hear from Investor Relations Officers that they are not getting ESG-related questions. While the roll-out earlier this year of ISS’s Environmental & Social QualityScore did succeed in drawing the attention of many management teams, are market participants any further ahead in having reliable, comparable, future-oriented decision-useful information? Have we perhaps narrowed our focus on climate change and carbon data a little too much, to the detriment of pushing for better disclosure of all ESG issues that are material to a company? At Millani, each year we comb through the websites and reports of companies in the S&P/TSX Composite Index to collect statistics on their corporate sustainability reporting or ESG reporting practices. While we are seeing a slight increase in the number of companies reporting on ESG issues, there is still a lot of room for improvement in Canada, with only 39% of companies in the index doing so in 2018 (up from 36% last year). In comparison, 93% of the largest companies around the world report on their sustainability practices. For the mainstream investors to integrate ESG, there remains a need for more companies to provide ESG information. Moreover, investors don’t just need more information, they need better information. Indeed, much has been said about the information disconnect between investors and companies, and how investors remain dissatisfied with the information they are getting from companies. In fact, we believe the information disconnect may be getting worse. We are finding that as investors’ ESG integration practices mature, their focus is sharpened, they seek more company-specific explanations of how material issues are managed, more granularity. They also seek more raw data, such as key performance indicators on individual material ESG issues, rather than an aggregated overall or partial rating from third-party service providers. To be clear, these third-party providers serve a purpose in bringing information to the market, but they have come under scrutiny of late, and their sheer numbers and disparateness may also contribute to increasing the information disconnect. If we want to see a broad-based uptake of ESG issues by capital markets, there remains a need for reporting issuers to provide company-specific information and quantitative performance metrics and targets on their financially material ESG issues. From working with companies, we know firsthand that they are aware of their material ESG issues – even though they may not call them by that name – and that they are managing them rather well. However, only if they communicate it to capital markets can they realize the inherent value of managing these issues well and generate the alpha that investors are seeking. We believe investors already hold the solution to their need for ESG information, in the very expression of active responsible investment practice: engagement. By asking questions to the management teams about their material ESG issues, by requesting they publish information on these issues, and by clearly describing what information they need to have, investors can drive the change they want to see in corporate ESG disclosures. Recognizing the appeal – and the pressure – in the responsible investment arena to embrace leading-edge practices that move the market forward and enhance competitiveness, we would simply advocate not to lose sight of the basics. As long as there is a need for more, appropriate, and quantitative data from companies, there will be a need for continued focus of engagement activities on ESG disclosures.